LOUISVILLE – Tired and weary-eyed from four weeks of travel, strange food and nonstop itineraries in a foreign country but bolstered by their faith and a powerful sense of accomplishment, the 2018 Peacemakers gathered together one final time at Laws Lodge on the Louisville Presbyterian Theological Seminary campus. 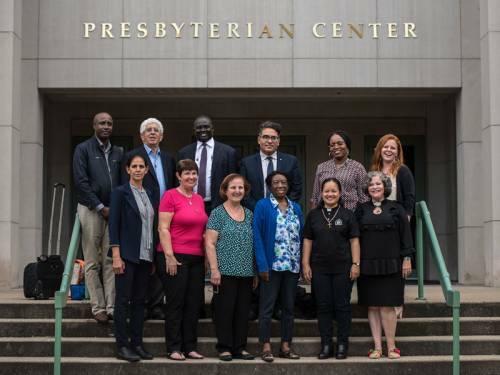 Seven of the 10 peacemakers met for two days of conversation and a debrief session to talk about their experiences with congregations, students and other organizations over the past month before heading back to their respective homes. All agreed that their experience positively impacted their work and would enrich it when they continued their mission upon returning home. Dr. Mary Mikhael, who represented the Evangelical Synod of Syria and Lebanon and has been to the U.S. numerous times previously, found a receptive audience even though many of the places she visited lacked up-to-date information about Syria, Lebanon and their church partners. “I was grateful for the opportunity to inform many churches and groups about the situation in Syria and ask for prayers and support to end the human tragedy that has been going on for eight years there. The whole world has been involved, we describe it as an international war on Syria ‘in’ Syria,” she said. The Rev. Manolis Ntamparakis, of Greece, has devoted much of his pastoral work to the spiritual transformation of young people. Most recently, he has been working with Syrian refugees in Greece. He visited several universities in his travels. A two-time International Peacemaker, the Rev. Jerome Bizimana of Rwanda works with genocide survivors. He was grateful to the church for the invitation to share his story again, even though those familiar with Rwanda’s history were taken aback by specific details such as 1 million Rwandan deaths in three months. The Rev. Perline Cooper, of Madagascar, was a last-minute replacement to the Peacemaker roster. She had to overcome perceptions of her country that aligned with the film “Madagascar,” an animated movie featuring an array of exotic animals. Cooper has three ministries she preaches to due to a lack of pastors in Madagascar. Cooper garnered a meeting with former New Jersey governor and former EPA director Christine Todd Whitman at one of her presentations. The former governor was inspired to learn more when she overheard a 15-year-old girl approach Cooper during a coffee break and asked how she could help the kids of Madagascar. “I got a lot of encouragement,” said Fabienne Jean of Haiti. “My experience with this program has given me more strength to go back and do my work.” Jean works with the Hands Together Foundation of Haiti serving her country’s impoverished population. “The way people received my message helped me feel more confident about doing my work in Haiti. They understood that Haiti needs more than just money; that we need people to accompany us and be with us to truly understand the situation and the work that we do,” said Jean. Although she isn’t a Peacemaker, mission co-worker Cindy Correll is accustomed to traveling and speaking to churches around the country. She accompanied Fabienne Jean as a translator. The Rev. Roceni Bakian, a full-time pastor with the United Church of Christ in the Philippines, left her country just days before Super Typhoon Mangkhut slammed the island nation in September. It was her first time visiting the U.S. and she thanked the PC(USA) for the opportunity. The Rev. Michael Muot Put, of South Sudan, found his hosts to be welcoming and generous. So generous, in fact, that when his computer accidently downloaded a virus that rendered it useless, Trinity Presbytery in South Carolina bought him a new computer. The International Peacemakers Program is made possible by your generous gifts to the Peace and Global Witness Offering. Since 1984, more than 300 International Peacemakers from more than 50 countries have participated in the program.